An automatically operated acoustic hood for a ‘Vertical Balancing Machine’ for a UK based machinery manufacturer with a worldwide customer base. 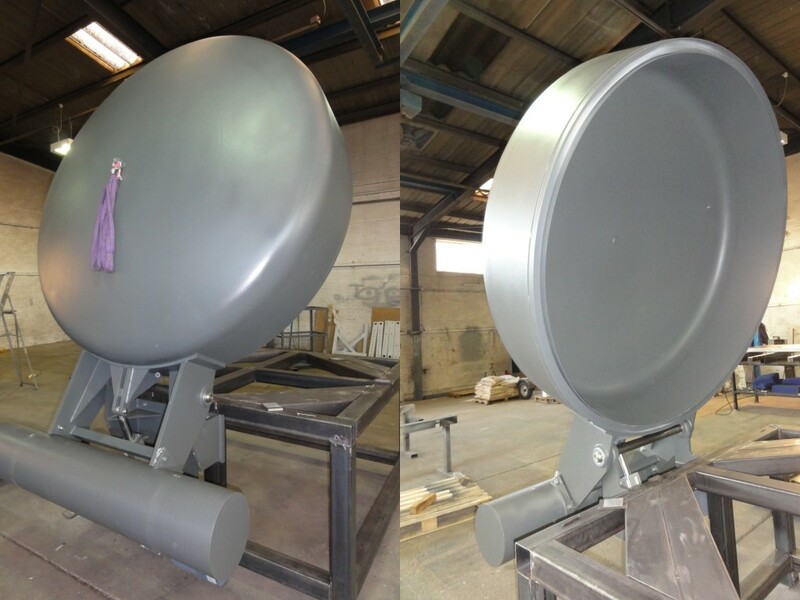 To design, manufacture and deliver the required acoustic hood, this being approximately 1.9m in diameter by 0.7m deep. The hood is to be mounted on an existing balancing machine, sized to accommodate all tooling and a full range of components parts to be balanced, automation to integrate with the existing equipment controls. The hood is to be ‘fit for purpose’ in providing a safe working environment for operators and maintenance personnel, incorporating a linear drive unit with ‘fail-safe’ facility and a counterbalanced hinged mechanism, so that the guard can be raised and lowered automatically, as & when required. In consideration of the 1000rpm rotor speed and the 1.7m diameter tooling, giving a peripheral/tip speed in excess of 200mph, it is essential that the hood is accurately manufactured for concentricity, with inner surfaces aerodynamically smooth (to minimise air turbulence and the potential for self/hood-generated noise brought about by aerodynamic imbalance within the restricted volume of the enclosed space – which could also lead to false results during the balancing process) and that the construction is robust enough to withstand the continued ‘wind buffeting effect’ internally, whilst remaining projectile/burst-safe. Based upon a maximum operational noise level of 95dB(A) at 1m from the unenclosed machine, we provided an acoustic hood to reduce noise levels by a minimum of 25dB, thereby bringing post-treatment operational noise levels down to circa 70dB(A), well below the First Exposure Action Level of the Control of Noise at Work Regulations 2005 and exceeding customer's expectations.